I am just kidding. But since this year Superbowl is all about soft and spongy balls, we decided to bring this time not a Super Bowl cake, but molten chocolate mini cakes. Place the chocolate and the butter in a small bowl and microwave it for 90 seconds. Mix the butter and the chocolate chips so that it will look like syrup. Pour the chocolate mixture into the egg mixture and stir. At first it will be very liquid, but as you stir, it will become thicker and looks like goo. Pour the mixture into the mold of your choice. 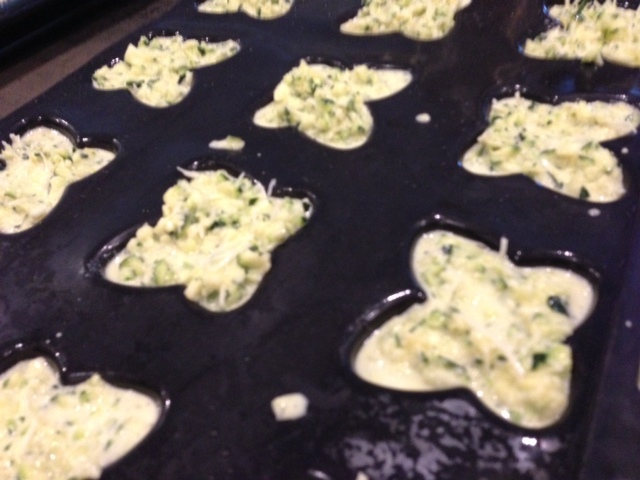 I chose the quenelle mold, but you can use the mini muffin mold. If you choose this mold, cook the cakes for 5 minutes for 400. Let the cakes cool completely in the mold until they are cold. Unmold them, and decorate them as you wish. 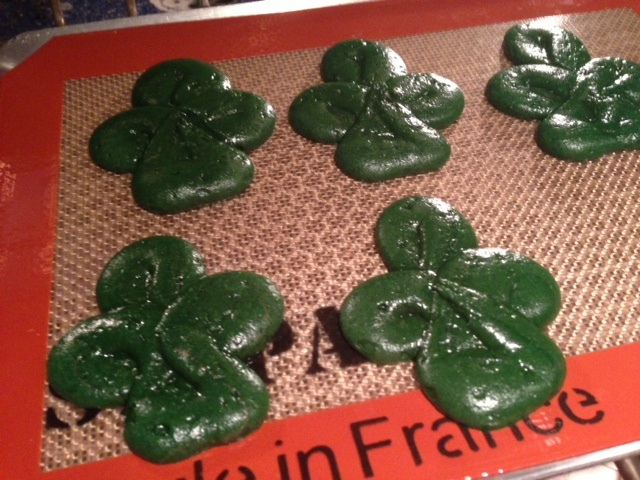 I chose brown icing to make the lace of the balls. Enjoy!!! Unmold them, and decorate them as you wish. I chose brown icing to make the lace of the balls.Enjoy!!! Did you know however not all Chinese restaurants offer Chinese Fortune cookies?!?! Yes. it is true. I learned the night of the cooking class that Fortune Cookies were An American tradition. Yep, it is true!! According to Wikepedia, “Fortune cookies are often served as a dessert in Chinese restaurants in the United States and some other countries, but are absent in China. 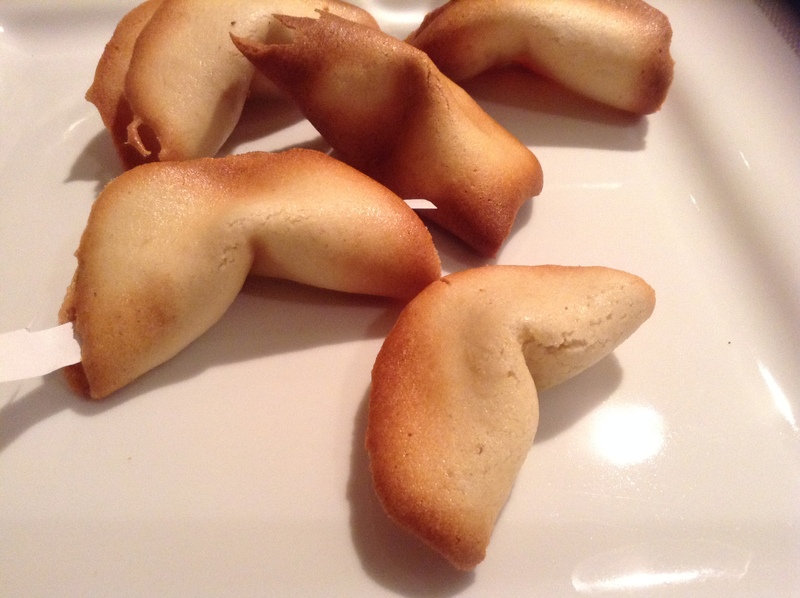 The exact origin of fortune cookies is unclear, though various immigrant groups in California claim to have popularized them in the early 20th century, basing their recipe on a traditional Japanese cracker. Fortune cookies have been summarized as being “introduced by the Japanese, popularized by the Chinese, but ultimately … consumed by Americans. As far back as the 19th century, a cookie very similar in appearance to the modern fortune cookie was made in Kyoto, Japan, and there is a Japanese temple tradition of random fortunes, called o-mikuji. The Japanese version of the cookie differs in several ways: they are a little bit larger; are made of darker dough; and their batter contains sesame and miso rather than vanilla and butter. They contain a fortune; however, the small slip of paper was wedged into the bend of the cookie rather than placed inside the hollow portion. This kind of cookie is called tsujiura senbei (辻占煎餅?) and are still sold in some regions of Japan, especially in Kanazawa, Ishikawa as the lucky items to start Happy New Year.Some said that it’s sold in the neighborhood of Fushimi Inari-taisha shrine in Kyoto. Most of the people who claim to have introduced the cookie to the United States are Japanese, so the theory is that these bakers were modifying a cookie design which they were aware of from their days in Japan. Makoto Hagiwara of Golden Gate Park’s Japanese Tea Garden in San Francisco is reported to have been the first person in the USA to have served the modern version of the cookie when he did so at the tea garden in the 1890s or early 1900s. 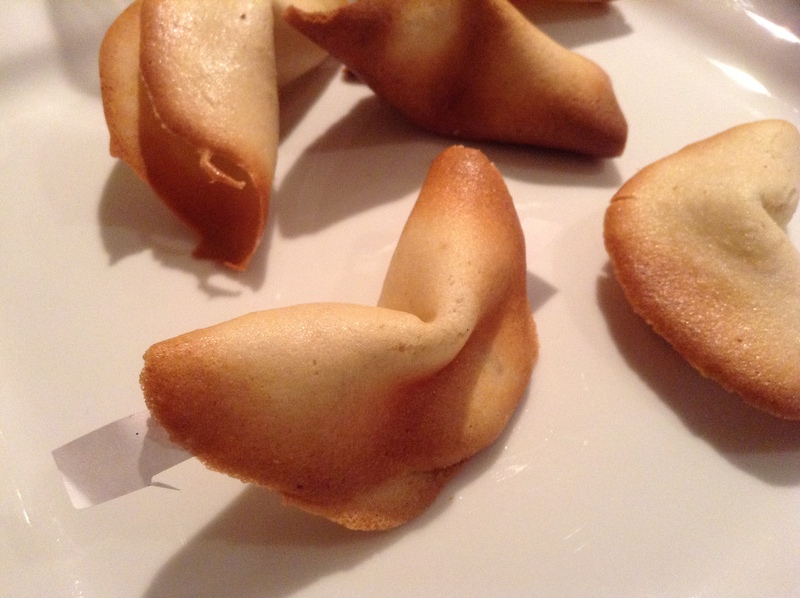 The fortune cookies were made by a San Francisco bakery, Benkyodo. David Jung, founder of the Hong Kong Noodle Company in Los Angeles, has made a competing claim that he invented the cookie in 1918.San Francisco’s mock Court of Historical Review attempted to settle the dispute in 1983. During the proceedings, a fortune cookie was introduced as a key piece of evidence with a message reading, “S.F. Judge who rules for L.A. Not Very Smart Cookie”. A federal judge of the Court of Historical Review determined that the cookie originated with Hagiwara and the court ruled in favor of San Francisco. Subsequently, the city of Los Angeles condemned the decision. 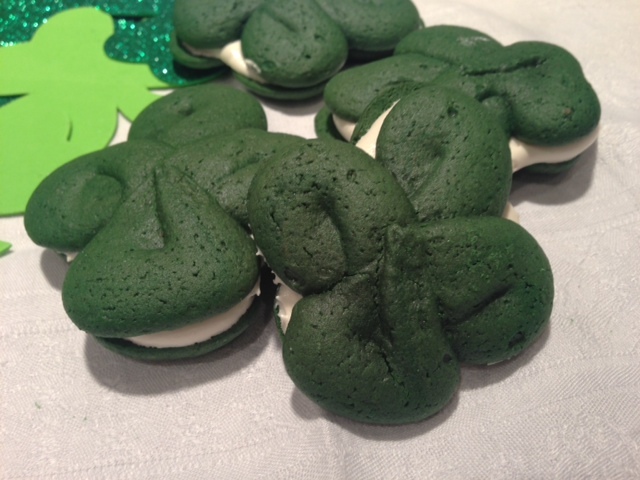 Well, for fun, you certainly can make them too. They are much more yummy than the real ones served at Chinese restaurants. Turn the oven to 375. Place a medium silpat onto a medium perforated sheet and set aside. In a medium bowl, lightly beat the egg white, vanilla extract, almond extract and vegetable oil. Add the water and mix well again. 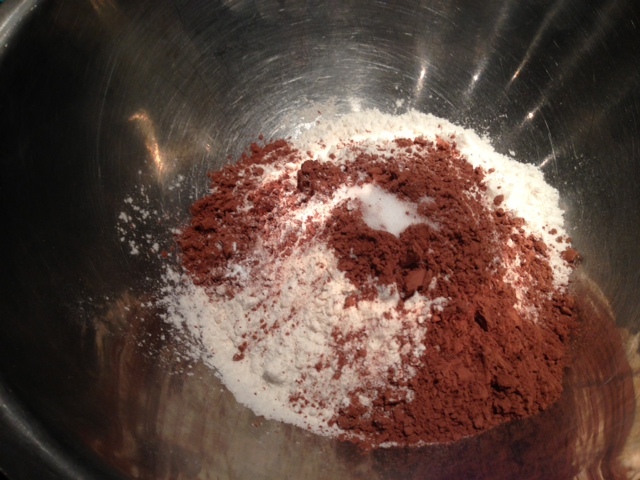 In another bowl, mix all the dry ingredients ( flour, cornstarch, salt and sugar). 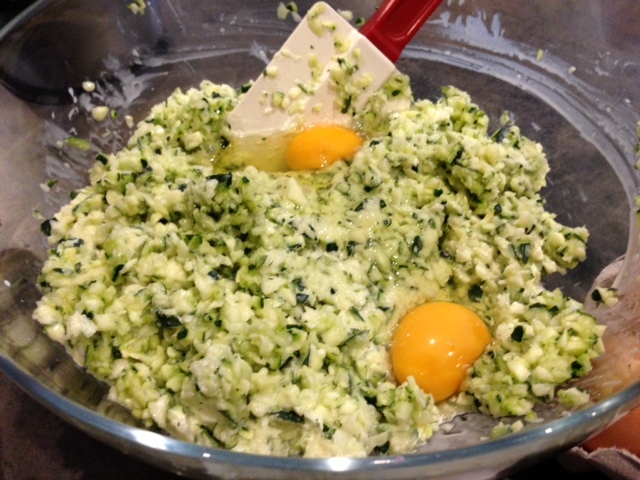 Add the flour into the egg white mixture and stir until you have a smooth batter. 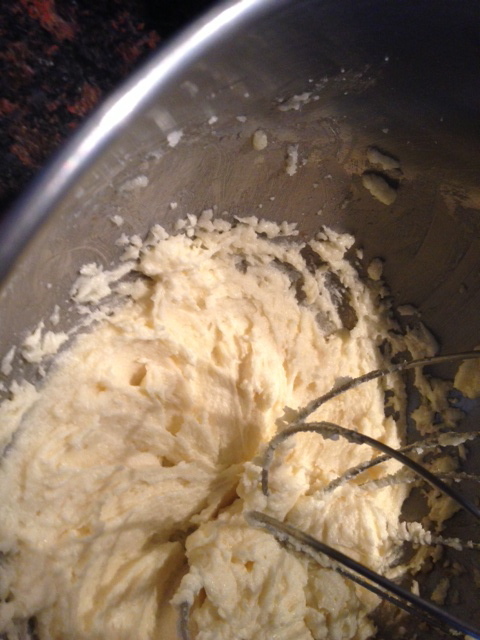 The batter should not be runny, but should drop easily off a wooden spoon. 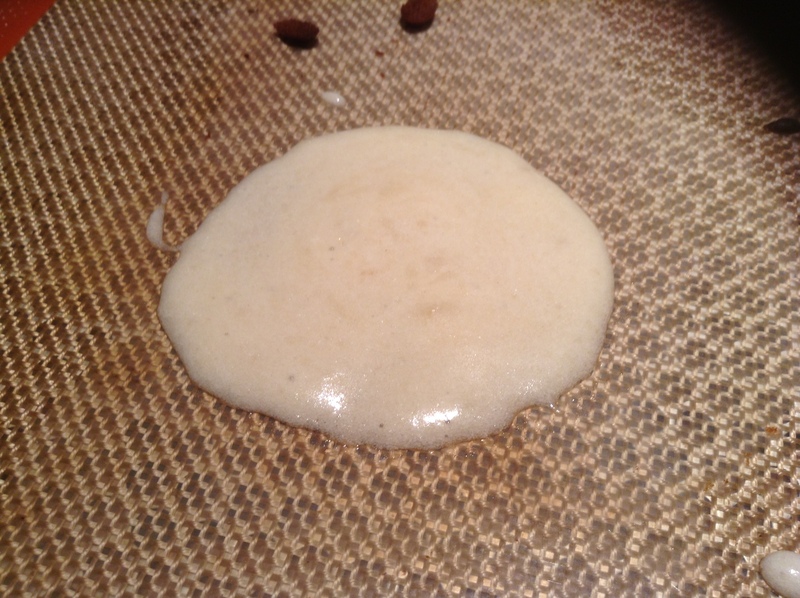 Using 1 tablespoon drop the batter onto the silpat, that you would have placed on a large perforated sheet, and with the back of the spoon, spread the batter into an even 2 1/2 inch wide circle. Only make 3 to 4 cookies at a time because they will cool too quickly, and you will not be able to shape them if you make too many at a times. 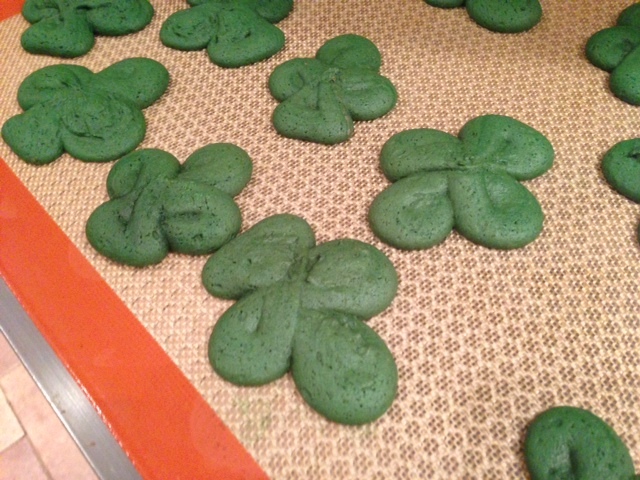 Bake until the outer 1/2-inch of each cookie turns golden brown and they are easy to remove from the baking sheet with a spatula (between 8 and 10 minutes). Working quickly, remove the cookie with a spatula and flip it over in your hand. 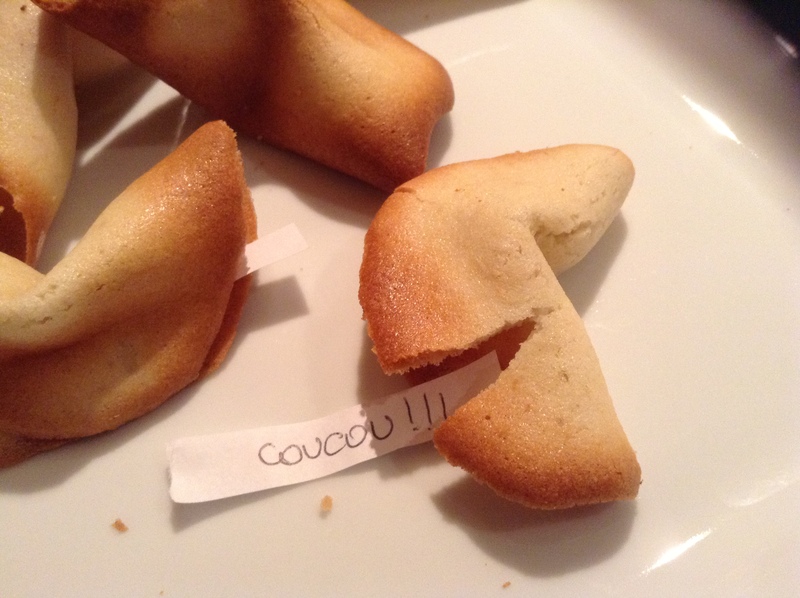 Place a fortune in the middle of a cookie. To form the fortune cookie shape, fold the cookie in half, then gently pull the edges downward over the rim of a glass, wooden spoon or the edge of a muffin tin. 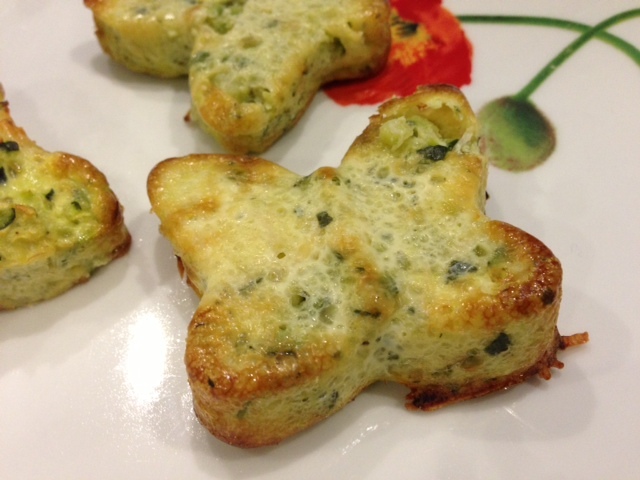 Place the finished cookie in the cup of the muffin tin so that it keeps its shape. Continue with the rest of the cookies. Repeat step 7-9 until you have used all the batter. Yum!!! The cookies will keep for a week in an airtight container. Using 1 tablespoon drop the batter onto the silpat, and with the back of the spoon, spread the batter into an even 2 1/2 inch wide circle. Only make 3 to 4 cookies at a time because they will cool too and you will not be able to shape them if you make too many. Working quickly, remove the cookie with a spatula and flip it over in your hand. 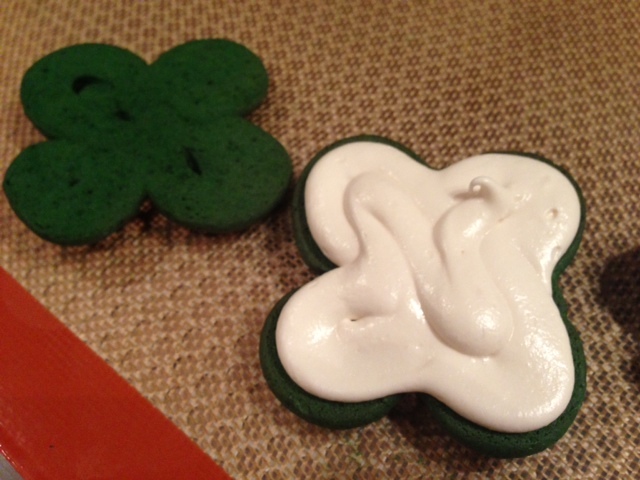 Place a fortune in the middle of a cookie. To form the fortune cookie shape, fold the cookie in half, then gently pull the edges downward over the rim of a glass, wooden spoon or the edge of a muffin tin. 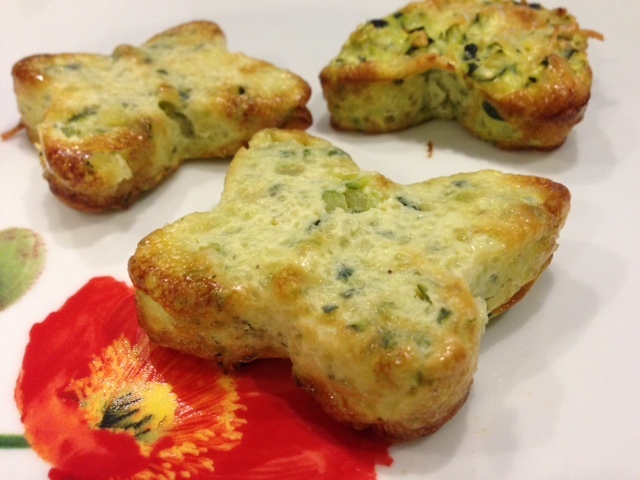 Place the finished cookie in the cup of the muffin tin so that it keeps its shape. Continue with the rest of the cookies. In the evening, after dinner, my husband likes to fix himself a cup of coffee, and sit on his sofa to watch a movie. He also likes to eat “a betthupfer” ( evening treat) while watching his movie. It can be an ice-cream, a dessert that I made, a chocolate bar, or even a bag of those miniature candy bars ( Milkie way, Twix, Almond joy). 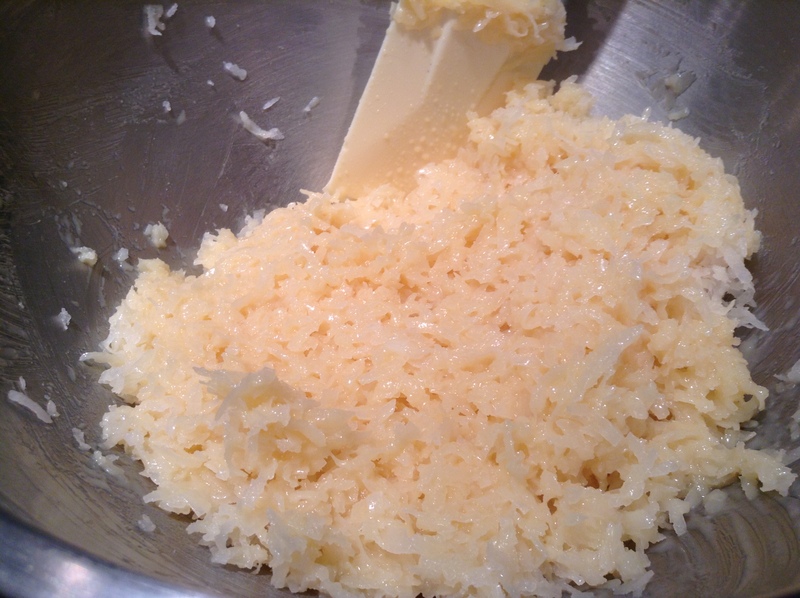 In a large bowl mix the coconut flakes and the condensed milk, and mix well. With a small spoon, pick a tablespoon of that mixture and mold it into a small oval that you will place on the silpat that you would have placed on a large perforated sheet. Continue until all has been used. Place them into the freezer to freeze for a minimum of an hour. When the coconut is hard, place the chocolate into a microwable bowl and cook it for 90 seconds. Stir with a fork. If needed, cook for another 30 seconds or until the chocolate is liquid. 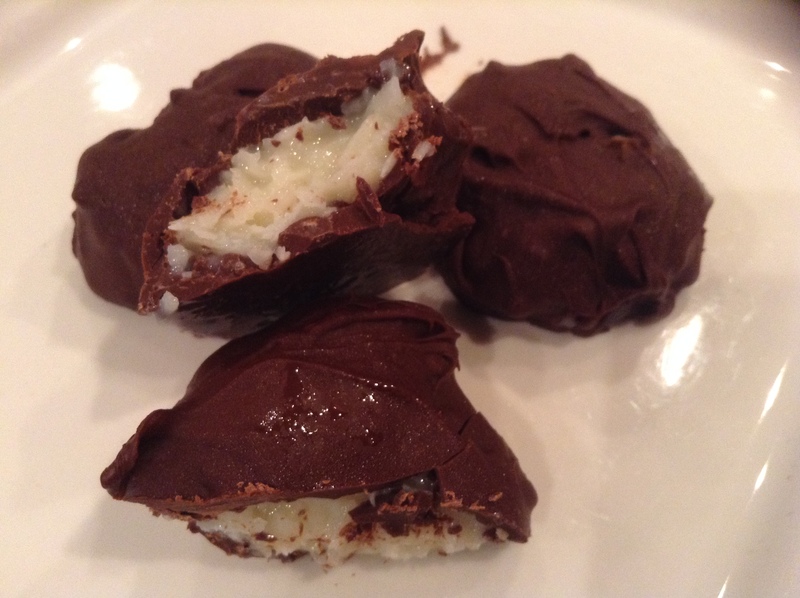 Place a coconut oval onto a fork and dip it into the melted chocolate. 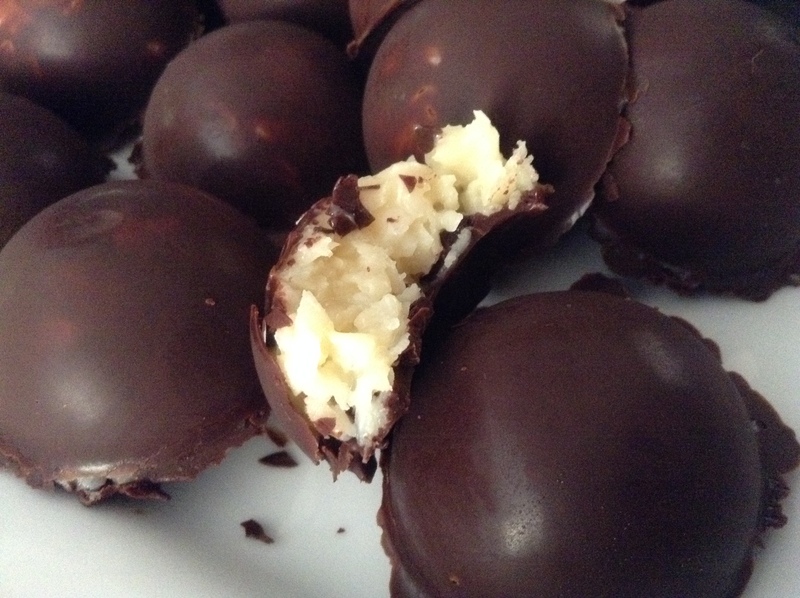 Place the chocolate covered coconut onto the silpat again. Place the tray back into the freezer so that the chocolate will cure. With a pastry brush, “paint” the inside of the mold of your choice. I used two trays: the oval tray and the pop tray. Place the tray into the fridge, or freezer to cure the chocolate. Meanwhile, prepare the filling. 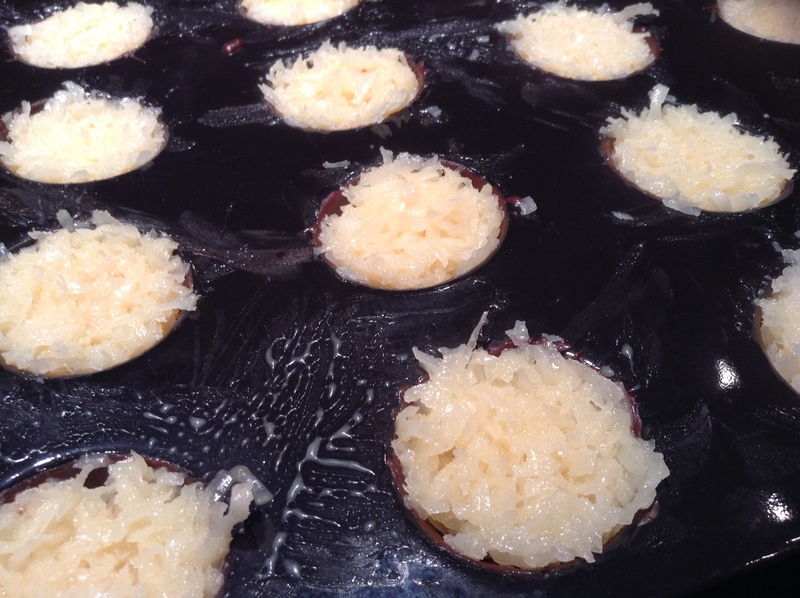 Mix together the coconut flakes and the condensed milk and fill the cavities of the tray. Place the tray back into the freezer. Let it rest for 30 minutes to an hour or until the coconut is frozen. With the pastry brush, brush the top of the coconut, and voila!!! Cheap Home-made Bounty. Yummm!!! You try! 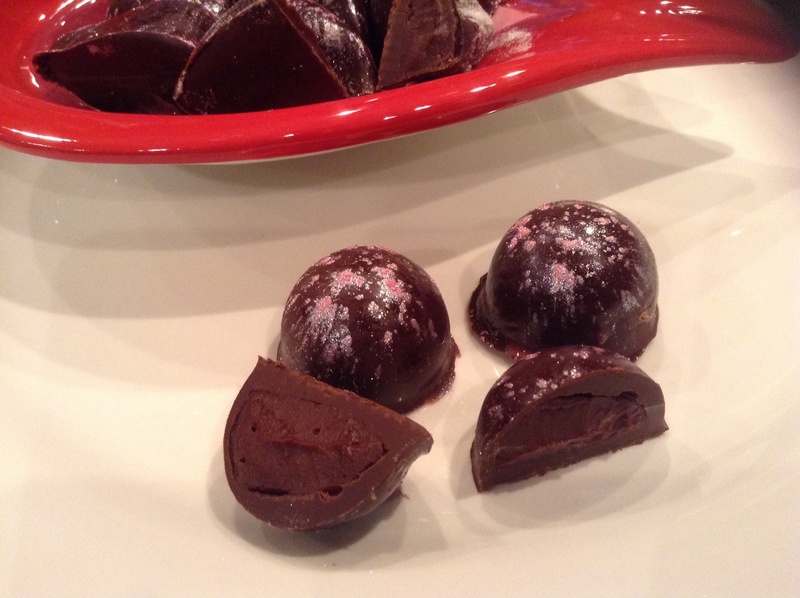 In one post, I tried to offer a light substitution to hot cocoa, and in another I offer a recipe of chocolate truffles. Well, what can i say??? I love chocolate so much that I want to be able to enjoy it without guilt and sometime i have to find ways to cut down those calories that is why I posted the recipe of a light hot cocoa. Chocolate is really one of my weaknesses. I love it, and need it at then end of my meal to satisfy my sweet tooth;-) I try not to indulge much because my trainer will fuss at me… But when I can indulge, then I want the real thing!!! As a French person, I am a bit of a snob and only eat European Chocolates. 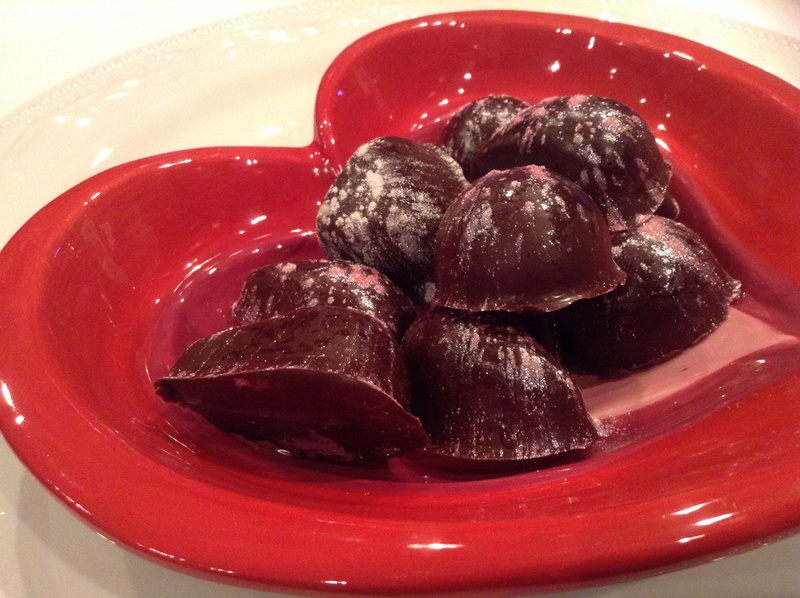 It is perhaps because the European Chocolates or truffles have a higher content of chocolate and taste like chocolate. Here in the US, my favorite is Godiva. The problem is that they are only sold in certain places and are quite expensive. Of course I could just buy some of the truffles already packages but they don’t exactly taste the best. 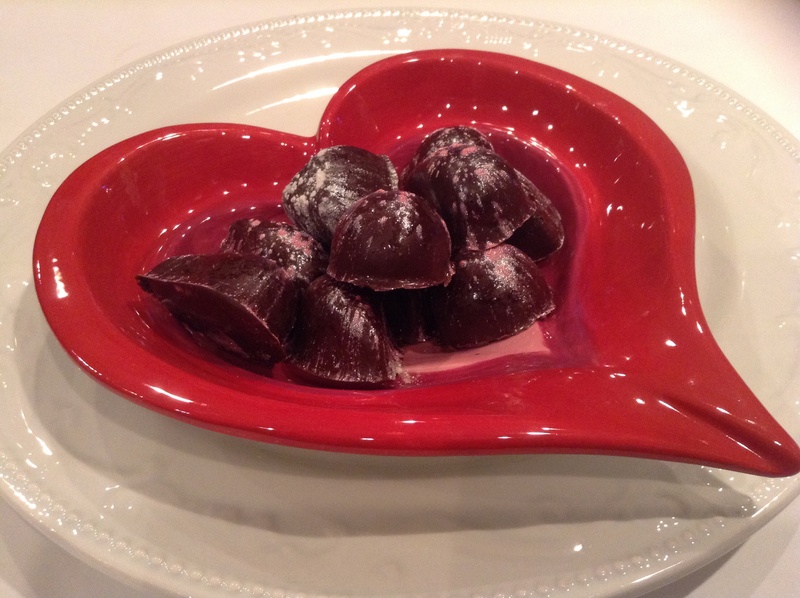 Well with Valentine’s Day around the corner and me stuck at home in a snow storm I thought to make some truffles today. They are fun to make, and really not that expensive. 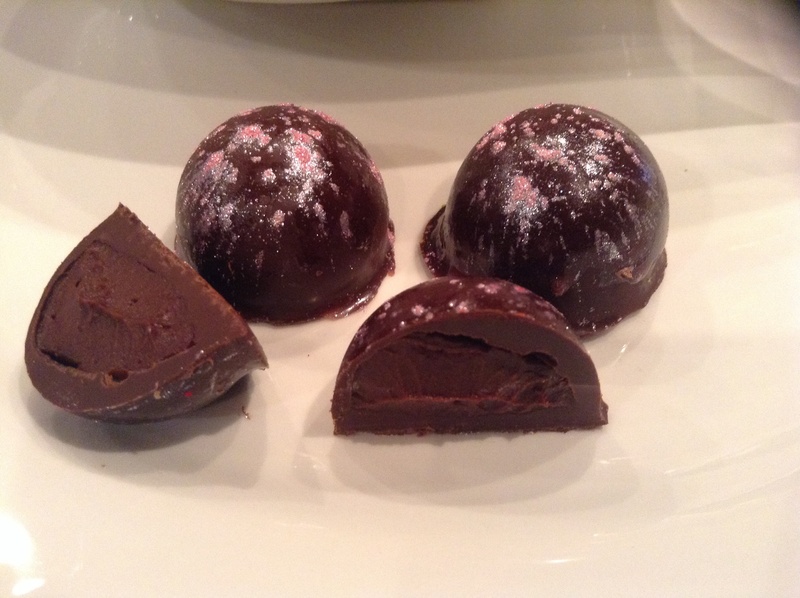 Real truffles are not hard to make, they just require a mold, and patience. Truffles can come in many flavors, but most of the time the filling is made either with ganache, buttercream, or craquin. 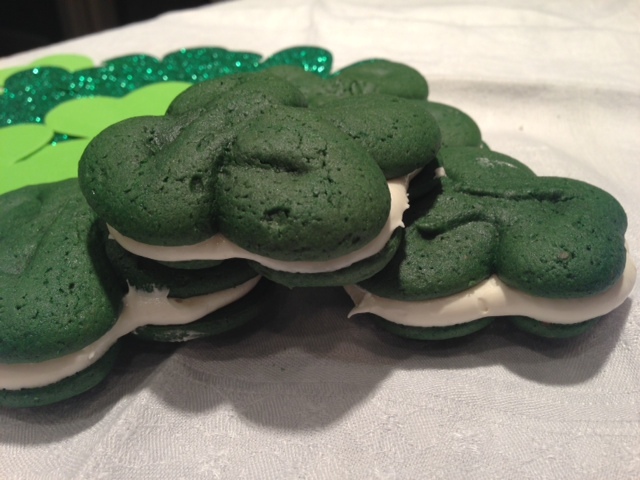 Today I will offer you a recipe that is very easy and is bound to be liked by many. Place the chocolate in a microwaveable bowl and microwave the chocolate for 90 seconds or until the chocolate is liquid and free of lumps. 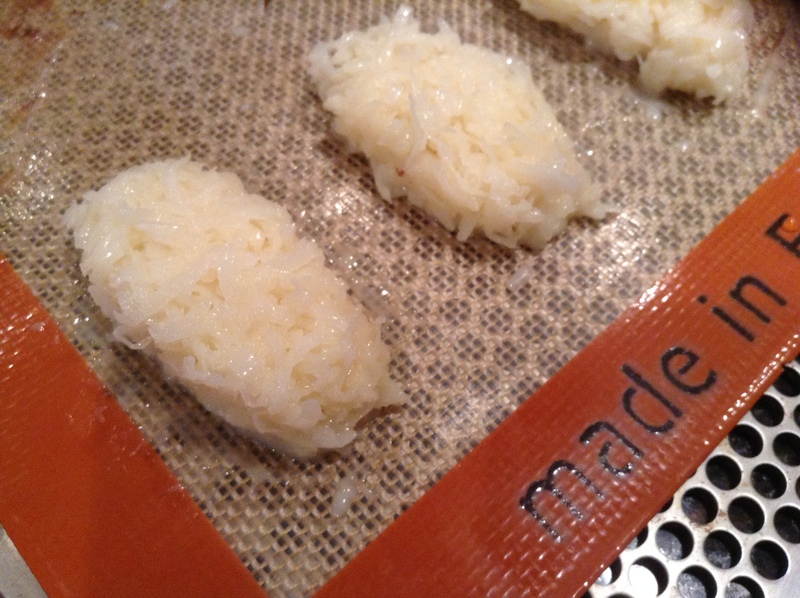 With a brush, brush the inside of each indentation of the truffle mold. 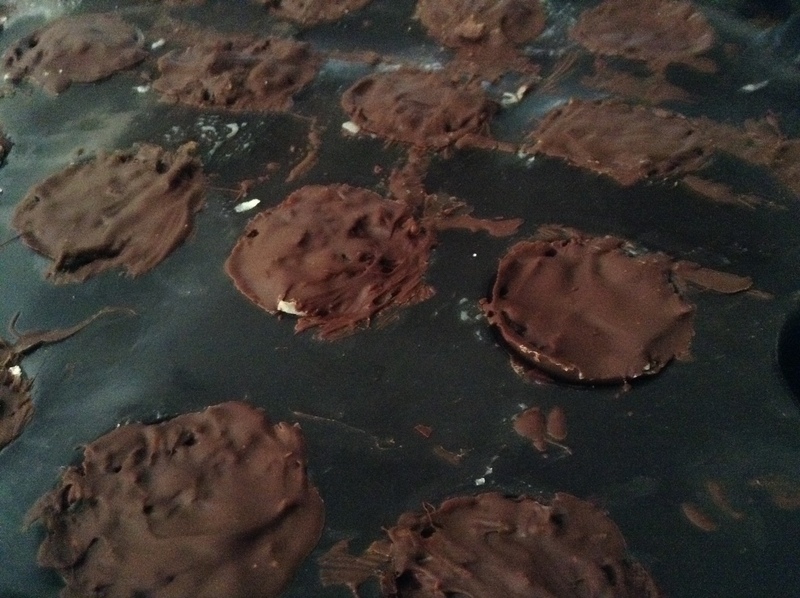 PLace the truffles in the fridge for the chocolate to cure. Rebrush the inside for another coat so that the truffles will not be too thin. Place the tray back into the fridge. Meanwhile place the cream into the microwave for 90 seconds and pour it over the chocolate chips,. Let it sit for a few seconds. Then with a small whisk, stir the cream to make a smooth ganache. Divide the ganache in 3 equal portions. Then add a few drops of the flavor that you wish. Today I used almond, orange and raspberry. 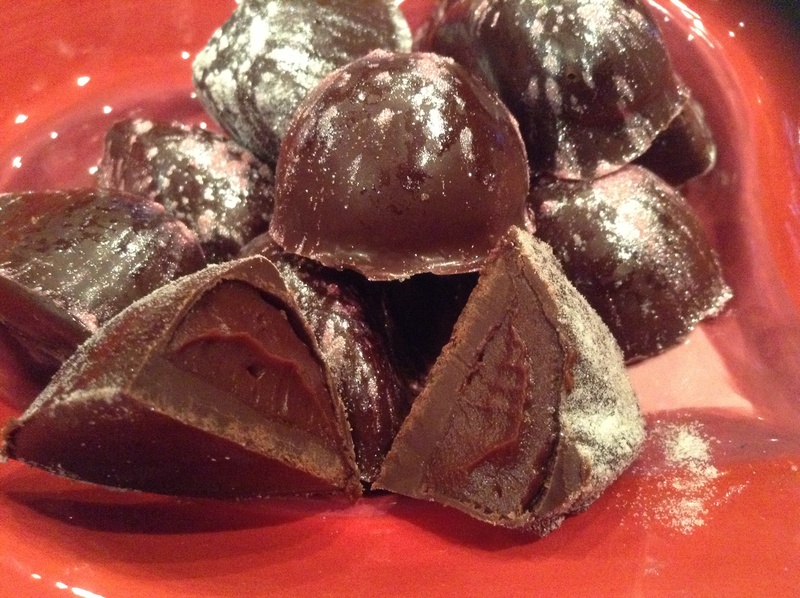 Fill the ganache in the truffles. Then place them into the freezer to cure. 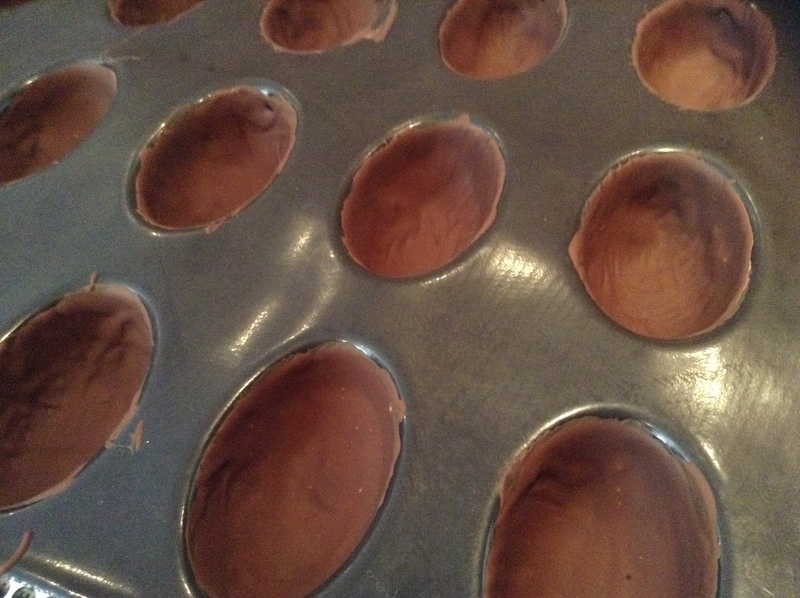 Rewarm the chocolate and brush the top of each truffle to close them up. Place them back into the fridge to cure. decorate as you wish. 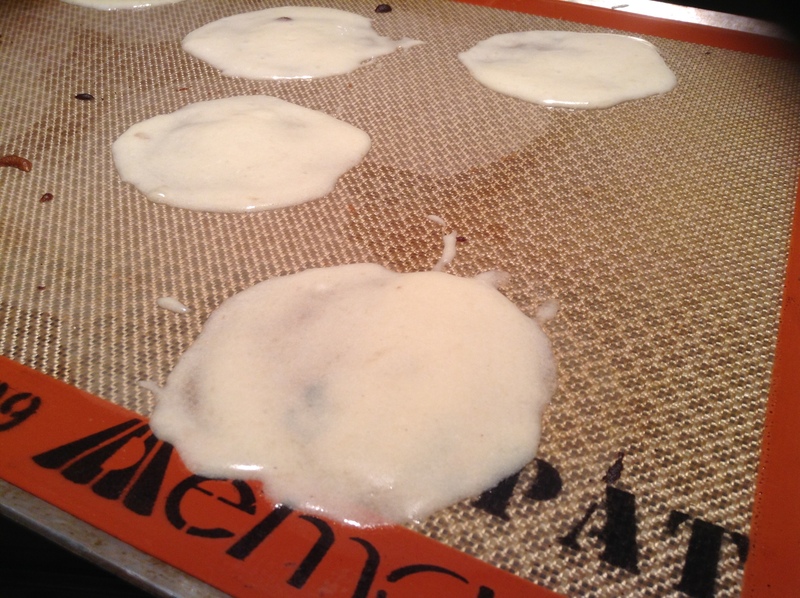 To decorate them, I brush each truffle with clear vanilla syrup and sprinkle over them . 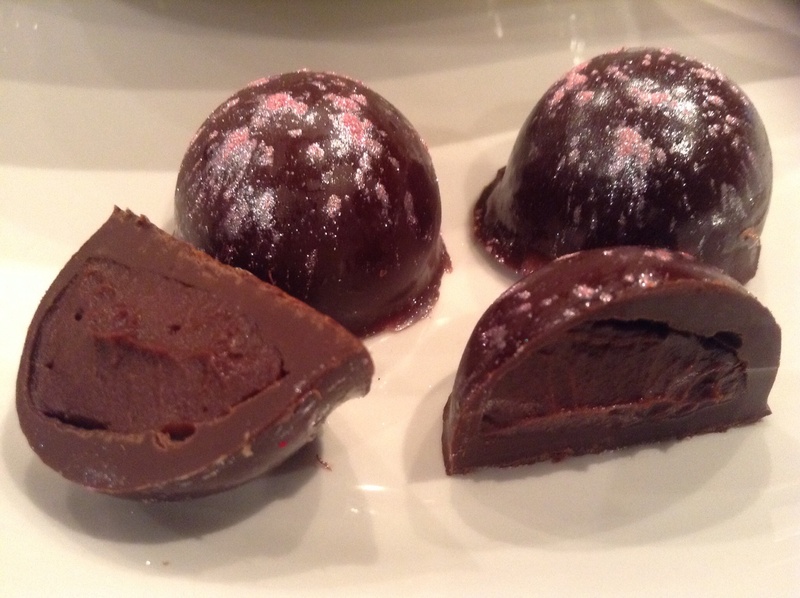 The truffles are wonderful to eat cold or at room temperature. Your turn to be creative!!! !